BEDMINSTER, N.J. (AP) — President-elect Donald Trump and Mitt Romney met Saturday at the billionaire’s golf club in New Jersey, both emerging with smiles and a public handshake but no word on what, if any, role the 2012 GOP hopeful might play in the new administration. The meeting alone was notable after the crackling rancor between the men all year. 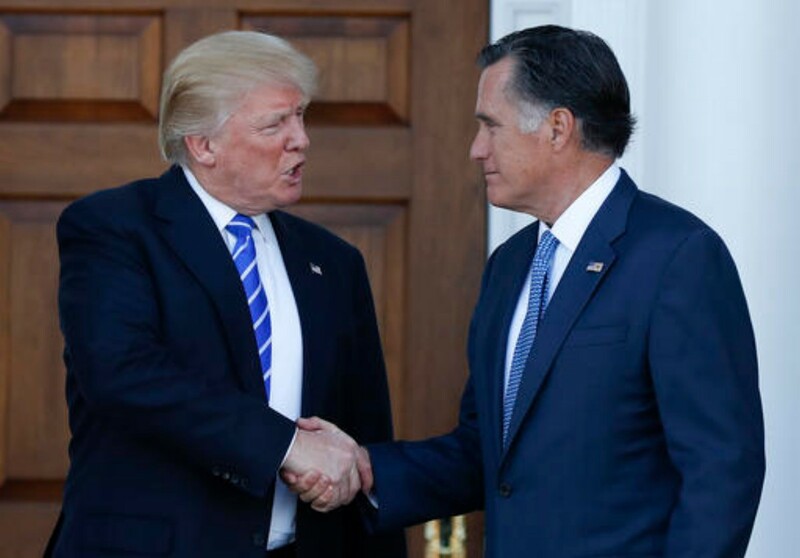 Romney assailed Trump in a stinging speech in March, calling him a “con man” and a “phony.” Trump responded by calling Romney a “loser” who “choked like a dog” during the 2012 election and let President Barack Obama win. But the two have started to make amends since the election. Romney called Trump to congratulate him after his victory over Democrat Hillary Clinton. Romney was only one of a parade of officials pouring through Trump’ door as the president-elect tries to fill more members of his administration. On Friday, Trump picked Alabama Sen. Jeff Sessions for attorney general and Kansas Rep. Mike Pompeo to head the CIA, signaling a sharp rightward shift in U.S. security policy as he begins to form his Cabinet. Trump also named retired Lt. Gen Michael Flynn as his national security adviser. Hosting the stream of visitors wasn’t Trump’s first public act of the day. First, there was Twitter. Trump then turned to meetings, perhaps about posts in his administration. Just on Saturday, Trump’s schedule included retired Marine Corps Gen. James Mattis, a potential contender to serve as Trump’s defense secretary, as well as Michelle Rhee and Betsy DeVos, two well-known education activists. And on Sunday, Trump was due to meet with several people, including New Jersey Gov. Chris Christie and former New York Mayor Rudy Giuliani. Trump’s announcement on Friday of Sessions, Pompeo and Flynn formed the first outlines of Trump’s Cabinet and national security teams. Given his lack of governing experience and vague policy proposals during the campaign, his selection of advisers is being scrutinized both in the U.S. and abroad. Trump’s initial decisions suggest a more aggressive military involvement in counterterror strategy and a greater emphasis on Islam’s role in stoking extremism. 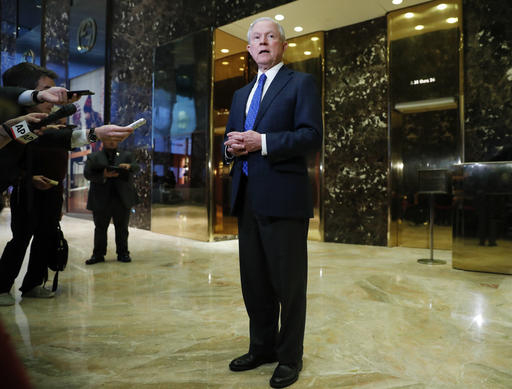 Sessions, who is best known for his hard line immigration views, has questioned whether terrorist suspects should benefit from the rights available in U.S. courts. Pompeo has said Muslim leaders are “potentially complicit” in attacks if they do not denounce violence carried out in the name of Islam. Sessions and Pompeo would both require Senate confirmation; Flynn would not. In a separate matter Friday, it was announced that Trump had agreed to a $25 million settlement to resolve three lawsuits over Trump University, his former school for real estate investors. The lawsuits alleged the school misled students and failed to deliver on its promises in programs that cost up to $35,000. Trump tweeted to his 15 million followers Saturday that he only settled to better focus on leading the U.S.
Story by CATHERINE LUCEY, Associated Press. Associated Press writers Laurie Kellman, Mark Kennedy, Errin Whack, Jonathan Lemire, Jill Colvin, Stephen Braun, Robert Burns and Jack Gillum and Elliot Spagat in San Diego contributed to this report. its too bad that we now have a president with the attention span of a chimpanzee, on the hand things would of been way out of balance if hillarious would of won and in the end the middle class is still paying for all the immigrants healthcare that are still becoming citizens because trump won’t be able to do what he said he was going to do. This is good to see these two together. ! 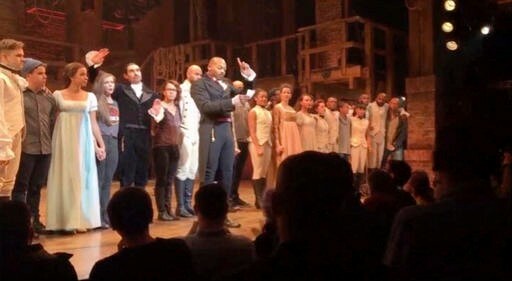 The hypocrisy of the directors and cast of “Hamilton” is rich. They buffoonishly lecture the Vice President Elect from the stage about “diversity”. But back on 24 March, the “Hamilton” casting call read, “Seeking NON-WHITE men and women, ages 20s to 30s, for Broadway and upcoming Tours!”.